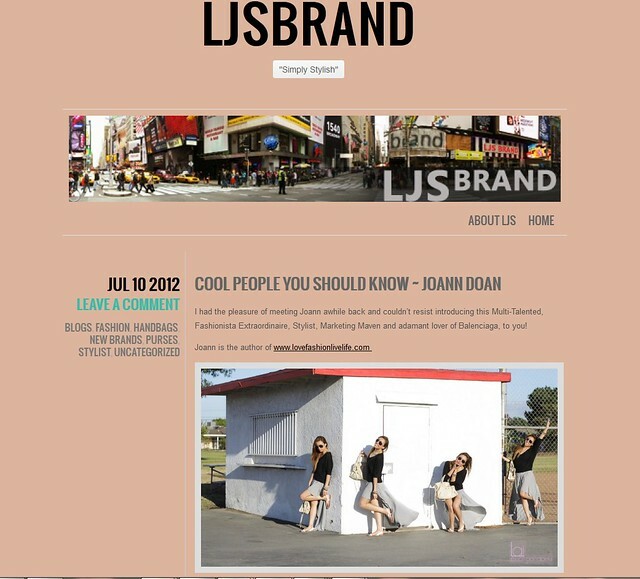 lovefashion | livelife: Feature on LJS! WOW what a productive month! i just finished an amazing fashion show for Senhoa and now i get featured on the LJS website! LJS brand is a SoCal based brand that provides the most fashion-forward and uberly practical accessories to fashionista's everywhere. i actually got to meet the owner of LJS, Laura Jane Schierhorn, at a corporate work function of all places and she is pleasantly upbeat and down to earth. i quickly fell in love with her purse designs at her trunk show in Long Beach and can't wait to see what she has next for the upcoming seasons! you can learn more about Laura and her inspirations for LJS here. here's a little preview of my featured interview on her "Cool People You Should Know" section. be sure to stay tuned for what's in store next for me and LJS!